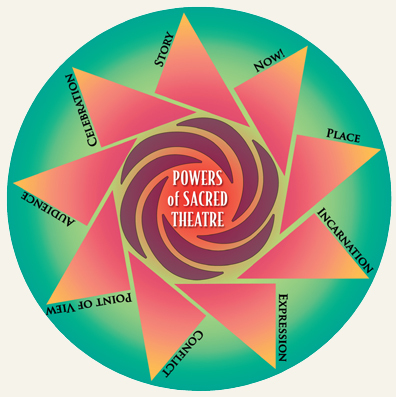 Sacred Theatre provides a way of looking at your life as a holy play, a wondrous work of performance art in progress, dedicated to forces beyond our capacity to imagine. These forces may be called gods; or ideals like Peace or Truth; or concatenations of energy, like Love or Beauty. Sometimes the play of your life makes you laugh, sometimes it makes you cry, sometimes it bores you, sometimes it thrills you. Playing the play of life is a daring adventure. It takes courage, focus, excitement, and intention to stop letting your life story just happen passively and instead stand up to enact it with verve and delight. 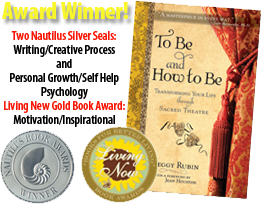 In Sacred Theatre, you are invited to fulfill a sacred task, which is to claim your rightful place as the star in your own life. the great gift you are here to incarnate as a joy to the world. the amazing story you are privileged to enact as part of the immense drama of Life on Earth. 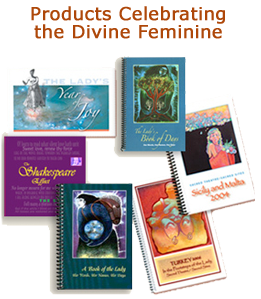 the fullness of each present moment’s capacity to embrace the past and encode the future. the wonder of taking a stand on your own sacred stage. the joy of pouring your life wisdom into full expression. the refreshment of looking at the world with new eyes. the potency of experiencing conflict as a path to growth. the dedication to your sacred audience, seen and unseen. the essence of life as a glorious celebration.